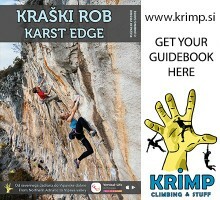 In March 2019, a new edition of guidebook for Karst edge was published. 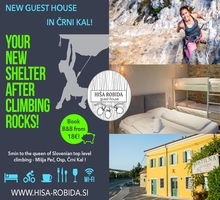 This time it’s even larger and richer, with additional areas of Vipava and Gorizia with crags Vipava, Vipavska Bela, Dolge Njive, Lijak and bouldering spot Vitovlje. As always, we try to make each edition better and more useful. 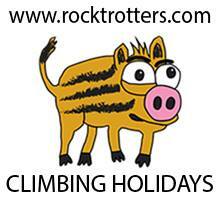 The new guidebook now has 20 crags and over 2600 routes in Slovenia and Italy. All other crags have been updated, freshly photographed and checked: Osp and Mišja peč, Črni Kal, Črnotiče and Risnik in Slovenia and Napoleonica, Santa Croce, Costiera, Aurisina, Grotta Katerina, Sistiana, Doberdo and Val Rosandra in Italy. The guidebook now has a more durable cover with useful ribbon, which will come useful, as the book has grown to 432 pages. Anyone who feels the book is too heavy to carry under the crag, will surely appreciate that the price includes a free of charge Vertical Life app, with which you will get all the crags in the book on your mobile phone. As you’re already used by now, the guidebook precisely, informatively and with a pinch of humor covers all the crags in the region, with updated grades and lines of routes, out of which everyone is marked on photo topo, often from multiple angles. Guidebook combines panoramic-drone shots from afar with super practical DOFAP photos from under the wall, which is the situation you will see as a climber, seeking your route. The book also has lots of informative texts about history, gastronomy and nature, along with climbing tips, interviews with prominent climbers and funny stories to pass the time. It’s all completed by many great photos and ticklists of routes at the end. And let’s not forget about the rest day section with tips what you should see and experience when you’re not climbing. The new layout will please people with poorer eyesight, as the fonts are much bigger, as well as the intro page and photo topos. The crag description has some useful icons, followed by overview of the weather conditions, style of climbing, comfort for children and safety and suitability of the crag with tips for different levels of climbers. Sometimes there’s some space left for a historical tidbit or anecdote. All the routes on the photo topos are color coded by grade for easier use. The guidebook is fully bilingual, in Slovene and English, with shorter translations to German, Italian, Croatian and French. By buying this topo you will also support the non-profit fund to rebolt the routes, Project OSP, whom we contribute to. 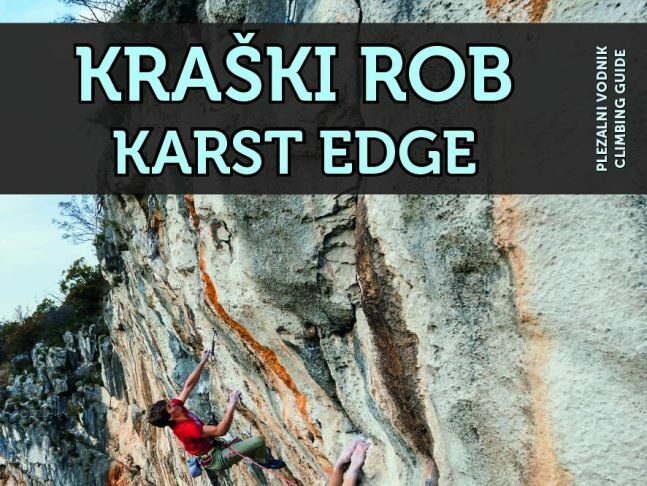 After just a few visits of the crags in the topo you surely won’t regret, that you spent your hard-earned money for this most complete encyclopedia of climbing on the Karst edge and wider. Big thanks also goes to all current users of our topos, who with your support enable us to build this vision, to benefit climbers, the area and everyone who shares it. The easiest way to buy it is on www.krimp.si, campsite Vovk in Osp and all Iglu sport shops in the region and elsewhere for 26,5€.